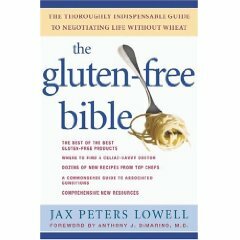 The Gluten Free Bible by Jax Peters Lowell. Over the past few years I have discovered that a number of my friends have struggled with the effects of gluten intolerance, and just about everyone I know knows someone who does. Gluten—a protein found in wheat, barley, rye, spelt and oats—is easily digestible by most of us, but for some reason a large percentage of people cannot tolerate it. While found distributed throughout the world population, gluten sensitivity is found mainly in those of European descent--including many Jews. For a fascinating discussion on the probable origins of gluten intolerance, read "Why So Many Intolerant to Gluten?" by Italian pediatrician Luigi Greco. For those of us who like to cook and entertain, it is wise to educate ourselves about this special food sensitivity and to learn how to prepare foods that our friends and loved ones—and we—can safely enjoy. Though there is a spectrum of sensitivity, the most debilitating form of gluten intolerance is Celiac Disease (CD), also called Celiac Sprue. CD is an autoimmune illness in which ingestion of gluten from any source causes damage to the villi of the small intestine (confirmed thorough biopsy and blood tests for gluten-reactive antibodies), impeding absorption of nutrients to important bodily systems. Over time, CD can cause a range of symptoms that include digestive trouble and diarrhea, fatigue, anemia, osteoporosis, skin rashes, neurological complaints (including epilepsy and dementia), and psychiatric disturbances (including depression and autism). CD was once little known and poorly understood by the medical community, yet it is now beginning to get the attention it has long deserved. At the annual convention of the Celiac Disease Foundation in May, 2009, Joseph Murray, MD, of the Mayo Clinic gave the following statistics: 30% of the population carries the gene for celiac disease but only 2% actually get CD. Even with the growing awareness, and the knowledge that 1 out of 132 people have CD, roughly 75% of sufferers are undiagnosed or misdiagnosed. Two conditions whose symptoms are similar to those of CD are irritable bowel syndrome and Crones, and many other autoimmune conditions resemble the profile of gluten sensitivity. Sadly, I have heard of those with gluten intolerance, before their diagnosis, being referred to psychiatrists with the admonition that their concerns are “all in their head.” Thanks to advocacy groups such as the National Foundation for Celiac Awareness, the Gluten Intolerance Group, and the Celiac Disease Foundation and many others (see Resources at the end of this article), a growing number of health practitioners now consider testing for gluten intolerance when their patients complain of its symptoms. Jax Peters Lowell, a Philadelphia-based poet and novelist who is author of the much acclaimed resource The Gluten-Free Bible, didn't discover she had the disease until she was in her 30s. "It can be very silent," she said. "The earlier the diagnosis, the quicker you can stop the associated conditions. The odds of developing symptoms increase as the child gets older." Jax told me "Celiac is a wonderful disease to have--because the food is the problem, but the food is also the cure!" Since CD and other gluten sensitivities are aggravated by eating the wrong foods--namely foods containing gluten—they are “fixed” by eating the right ones--just about everything else! A diet built around fresh fruits and vegetables, simply prepared meats, poultry, fish, nuts and seeds, along with safe alternate grains, is the healthiest way to go. The most widely available grains that don't include gluten include quinoa, millet, buckwheat, amaranth, rice, and corn. Another safe grain, teff, can be found in some health food stores and online. Other special ingredients, such as tapioca, xanthan gum, and sorghum, add texture and other important properties to breads and other baked goods. The G-Free Diet by Elisabeth Hasselbeck. It is no longer as difficult as it once was for sufferers to find substitutes for wheat and gluten-containing prepared foods. Luckily, food packages bearing a "gluten-free" symbol are now everywhere, and health store and supermarket shelves show a burgeoning array of gluten-free products. Yet it is often not possible to discern all the ingredients in prepared foods, and many foods that would on the surface seem to be safe contain trace particles of gluten due to processing. If the front of the package does not spell it out, check to see if the ingredient list or Nutrition Facts table state "This is a Gluten Free Product." If you've attempted to shop for gluten-free products, though, you'll see that they tend to cost quite a bit more than the products they're designed to replace. A timely article in the August 15, 2009 New York Times Business section, entitled "The Expense of Eating with Celiac Disease," reflects on the challenge and gives some excellent suggestions and resources for managing the high cost of living gluten-free. Jax also encourages folks with gluten intolerance, when dining out, to ask chef for gluten-free menu recommendations or make adjustments to a recipe. "Chefs are wonderful people who love to please their customers," she said. "Don’t be afraid to bring along a package of your special gluten-free pasta or bread!" The first challenge has to do with the enjoyment and blessing of bread, in Judaism called "the staff of life," and the very basis of a meal. Those who are gluten-intolerant cannot observe the mitzvah of saying the blessing 'hamotzi lechem min ha'aretz' over bread, specifically over challah on Shabbat and Yom Tov. During these times, Jews sit down to several meals containing challah. This can be problematic for the person who is gluten-sensitive, as according to halacha, Jewish law, one only can only observe the mitzvah of saying hamotzi over five grains specified in the Torah--namely wheat, spelt, barley, rye, and oats--the first four of which are the very grains people with gluten intolerance can't eat.. Oats, though not a gluten-containing grain, is often processed in facilities that process wheat, and so is widely avoided by those who avoid gluten. There are a good number of gluten-intolerant people who can tolerate oats, so it is often seen as a recipe ingredient in gluten-free cookbooks. Fortunately, there are now several companies that make challah with rice flour or a combination of acceptable grains, including corn, though the blessing said over rice or corn bread is not hamotzi, and one does not wash prior to saying the blessing for rice or corn bread. The bracha for rice bread is 'borei minei mezonot' (a blessing said over any foods other than bread such as cereal and crackers made from any of the five grains, though rice and rice products were added to the list by the rabbis who put together the canon of Jewish law). The bracha for corn bread is 'shehakol nihiyeh bidvaro,' (a "catch-all" blessing said over foods that are no longer in their original, recognizable form) regardless of the amount eaten. Solutions for some include not eating any gluten-containing bread at all or eating just a tiny bit (depending on the sensitivity level) in order to say the hamotzi bracha. Sid Karp, founder and publisher of the Jewish Celiacs Newsletter , related to me that a celiac friend at his shul was despondent about not being able to follow halakha by fulfilling the mitzvah of saying 'hamotzi' over and eating the five grains: "I told him, 'If this (gluten-free) bread is your bread, if this is your sustenance, then this is your hamotzi. '" The way Sid sees it, "if I can't eat it, then I shouldn't worry about not being able to make hamotzi over it." Fortunately, Jewish law does make concessions for those with life-threatening food sensitivities and allergies, as pikuach nefesh (saving one's life) takes precedence over the observance of mitzvot. Another challenge to the gluten-intolerant occurs during Passover, with the observance of the commandment to eat matzah, which halachically needs to be made from one of the five abovementioned grains. My friend Diane (who diagnosed her celiac herself through a process of food-group elimination, confirmed by biopsy) shared the special challenges Passover can bring for those with gluten intolerance: "I remember thinking that Passover would be better, but it's worse: first, almost everything has matzah meal in it. There's a positive commandment to eat matzah--how does one do that? That stumped even me, because I get more frum (religious) during Pesach!" As mentioned earlier, oat matzah is permissible, however it is not well-tolerated by many, leaving them to feel outside of the communal experience of matzah-consumption, and thus full observance of the Pesach festival. In addition to gluten-containing grains all being forbidden for all Jews over Pesach, Ashkenazi Jews are also prohibited from eating rice and corn, so it can be very frustrating for those with gluten sensitivities. "When I was first diagnosed," Diane continued, "I began to face Pesach as a time of deprivation, where before it was a time of liberation and a literal and metaphoric getting chametz out of my life!" She wondered, "How do I do this in a conscious way when it's just potatoes? So Pesach became about quinoa and buckwheat." One piece of advice for those with gluten-intolerance during Pesach is to incorporate your new diet with your family, making dishes you will all be able to enjoy. It can still be supremely challenging if everyone wants the matzah meal kugel they've always loved, so go ahead and make it--just make sure to have something you will be happy with, too. The website of the Jewish Celiacs Newsletter, has a wealth of information for those who are newly diagnosed--check out its excellent FAQs section--and many links to gluten-free resources. Founder Sid Karp, a disabled veteran, selflessly created the newsletter and website after being diagnosed with celiac disease in 1999 in order to help readers learn about and cope with the condition and to raise awareness about issues of particular interest to Jews. His project is funded totally by donations. Another good website for the Jewish gluten-sensitive, whose author, known only as Anne, hails from the UK. Anne gives readers a good introduction to life with celiac disease, helpful cooking conversion charts, her recommended "basic store cupboard," and a generous assortment of gluten-free recipes. Living Without, "The magazine for people with allergies and food sensitivities," always has some good articles about gluten intolerance. 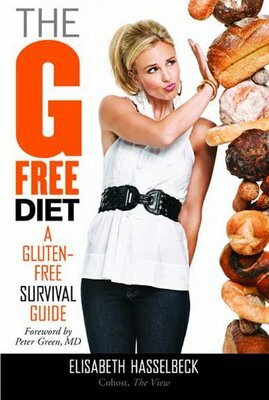 The August/September 2009 issue features an exclusive interview with celiac sufferer Elisabeth Hasselbeck, co-host of the television program The View, and author of the recently published The G-Free Diet: A Gluten-Free Survival Guide. Elisabeth shares her personal wisdom and an Appendix that is chock full of great resources. The recipes in this month's column can be part of your Rosh Hashannah dinner and enjoyed throughout the year. I encourage you to explore the cookbooks and websites referenced, and to try your hand at techniques that are new to you! The note in this interesting and unusual turkey recipe in Cooking Free by Carol Fenster states, "This recipe works best with a fresh turkey (which has no questionable additives). The brining imparts moisture and flavor and works best with a turkey under 14 pounds because it will fit into a large pot." Since kosher turkey is naturally more salty than non-kosher, I have reduced the salt in Carol's recipe by 25 percent. In a very large stockpot or canning pot, combine salt, honey, bay leaves, thyme, cloves, allspice, peppercorns, and 2 cups of water. Bring to a boil, stirring until salt dissolves. Remove from heat and add remaining water. Let cool. Rinse fresh turkey; check for pinfeathers. Remove giblets; wash cavities thoroughly. Place turkey breast-side-down in brine, covering completely. If not, add more water. Cover and refrigerate overnight. Pat turkey dry. Do not add additional salt. Place in large roaster pan and roast at 350 degrees F, basting frequently. Turkey is done when a thermometer inserted into breast meat registers 180 degrees F. Remove turkey from oven and let sit in roasting pan, covered, 15-20 minutes before carving. Serve with gluten-free gravy (see next recipe). Also from Cooking Free. Adjust the herbs and spices to suit your taste. Each thickener produces a different texture. Combine 1 1/4 cups of the broth and strained drippings in heavy saucepan, reserving 1/2 cup of the broth for step 2. Place pan over medium-high heat; add seasonings. Stir thickener into 1/2 cup reserved broth, making thin paste. Gently whisk thickening mixture into pan, continuing to whisk until mixture thickens and boils. Adjust consistency by adding more thickener or chicken broth. Remove from heat. Strain, if desired. Taste and adjust seasonings, if necessary. This superb potato kugel comes from Susie Fishbein's Kosher by Design. It uses no matzah meal or flour, as found in most other potato kugel recipes, and is sure to become your family's favorite. Place the oil into a large 9- by 13-inch rectangular baking pan; set aside. Fill a large bowl with cold water and add some ice cubes. Peel the potatoes and place them into the bowl of cold water. This will prevent them from turning brown. Finely chop the onions in the container of a food processor fitted with a metal blade. Remove them to a large bowl. Cut the potatoes into chunks and place them into the food processor; process until almost smooth. Add the potatoes to the onions. Add the salt, pepper, and sugar to the potato mixture. Add the eggs and stir until thoroughly combined. Place the baking pan with the oil into the oven. When the oil sizzles, carefully remove from oven and spoon some of it into the potato mixture. This will help make the kugel fluffy. Mix well. Pour the potatoes into the oiled pan. Bake, uncovered, for 1 hour. This yummy pilaf from Susie O'Brien's Gluten-free, Sugar-free Cooking, made from one of my favorite gluten-free grains, will be a hit alongside poultry and as a stand-alone vegetarian entrée or side dish. Try it as a filling for stuffed tomatoes or peppers! Heat 3 tablespoons of the oil in a large skillet. Sauté the onion, squash, pepper, garlic, apples, and mushrooms over medium heat until the onion is soft and the squash is browned. Add the sage, salt, and pepper to taste. Set aside. 4 cups of water to a boil. Add the bay leaves and quinoa. After the water comes to a boil again, reduce the heat to low and cover. Cook for about 20 minutes. Remove from the heat and discard the bay leaves. Combine the sautéed vegetables and quinoa. Add the remaining oil. Add the dried cranberries, fresh parsley, lime juice, and pecans. Toss and serve. Wash the carrots well and slice into 1/4-inch disks. Steam the carrots in a steamer or in a saucepan with a small amount of water for about 15 minutes or until tender. Once the carrots are cooked, place the butter or buttery spread in a skillet and stir in the agave nectar. Add the orange juice and carrots and simmer for 5 minutes. Add the ginger, salt, and pepper and cook until the carrots are heated through and a nice glaze develops. This moist, delicious cake recipe is from www.glutenfreebay.blogspot.com. Optional: Honey, toasted almond slivers, pecan pieces and/or powdered sugar for topping. I discovered this all-purpose gluten-free baking mix from Carol Fenster's Gluten-Free Quick and Easy on the great blog www.glutenfreebay.blogspot.com. A note by the blog's author said "Carol recommends cornstarch as a substitute for potato starch, but I personally try to avoid using refined corn products as much as possible. She recommends sorghum flour, which I love, but brown rice flour would work just fine, in my experience. So far I have had luck using this mix as a base for a yeast pizza dough, and for a cake."